Engine Four stroke, V-Twin, DOHC, 4 valves per cylinder. The VN750 remained largely unchanged throughout its 22-year production run with only minor adjustments to the components and varying paint schemes. The VN750 was unique in its class by featuring a more reliable shaft drive usually found on larger cruisers. 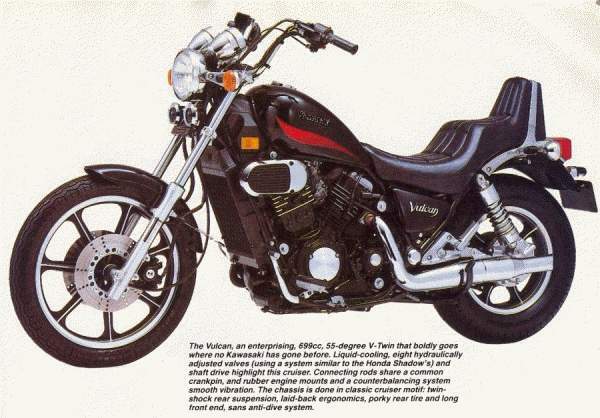 The bike also featured a liquid cooled DOHC V-twin engine producing 66 horsepower and a flat 47 ft-lbs of torque throughout most of the rpm range, although the engine was underrated and commonly produced 8-10% more than the advertised power in dynomometer testing. The bike was configured to support an upright riding position with a king/queen seat and a factory installed sissy bar. The VN750 also featured adjustable air shocks front and rear, with Showa 4-way valving on the rear.